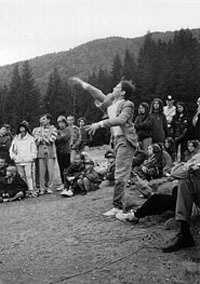 The AnnART - International Living Art Festival was organized by the BAÁSZ Art Foundation, the ETNA Alternative Art Group and the ETNA Foundation between 1990-1999 at the St.Ann Lake, Harghita county, Transylvania region, Romania. The festival through ten editions hosted altogether 121 artist participants from 26 countries. 20.00 - TORÓ Attila, Romania: Symbiosis II. 13.00 - Pia LINDMAN, Finland/Norway: Home Production II. The history of Performance Art in Romania has become more consistent during the last 10 years. 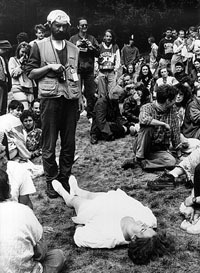 Until the events of December 1989, like other zones of art yet considered unconventional, it had usually been associated with the underground. It only came to the surface in the nineties, beginning to conquer the spaces and the public which can be considered normal in terms of its international domain of definition. 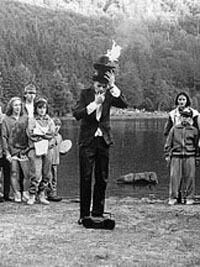 Although there still exists a certain kind of conservatism in the way it is received and reflected in the mass media which renders Performance Art somewhat marginalized and with a flavour of experimentalism, these aspects, however, are gradually diminishing. Nevertheless, for the time being it is only in very few situations that performance art condensed in independent and regular manifestations. In this context, the AnnART Festival is a most meritorious example through its continuity and longevity (it is organized in the region of the St. Ann Lake annually, without interruption since 1990). The international dimension of the festival became apparent only a couple of years ago. 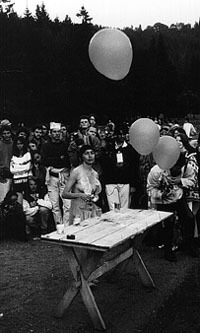 In July 1996 (each year the living art days have been scheduled for the end of mid-summer, at St. Anns high day) a record number of participants was achieved. More performers, both Romanian and foreign, than ever. The manifestation entered an international circuit, representing more and more a place of meeting for a number of artists who personalize the world map, the usual courses of this expressional modality, the art of performance being one of the peremptory conditions of what one might call cultural nomadism today. The qualities of AnnARTs natural environmental frame, the upsetting beauty of the places calling for protection (there does exist a local policy to provide this), stimulate the ecological connotations of the festival. Technology has a reduced representation here and there is no need to have more of it. For a couple of days, the participants have to adapt in their interventions, even in their lifestyle, to the rhythm of nature(often submitting even to its whimsicalities), by simplicity and and essentialisation. In the summer of 1996 more situations (than in previous editions) came about when the respect of certain objective conditions and the rather passive acceptance of the given surroundings transformed into a deep communication with nature, with its elements and their phenomena: earth, water, fire, forest, vibrations of the air, rain and blue sky, seen and unseen, which entered the equation of certain performances pointing out ideas like the regeneration of life, the harmony between individual and environment, the metaphysics of nature. The shiver of the substantial rediscovery of the green universe, the awareness of the flow of energy which unpolluted nature embraces us with, captivated the receivers too, making them look in a different, fresh way at the world in which they live. Thus AnnART 7 offered good potential illustrations of what Suzi GABLIK calls in even the title of one of her more recent volumes The Reenchantment of Art. Let us refer to the actions of Roddy HUNTER(Scotland), SZÜCS Enikő (Slovakia), André STITT (England) as being maybe the closest to the core of the issues mentioned above. The power and purity of the elements of nature were connected to other stakes, too, as a background or contrast factor for their realization. In general, problematization, diversified and sometimes dense, topical and with local or international resonance, structured pregnantly AnnART 7, without affecting the aspect of the spectacular. Even the opening of the festival became an action, realized by the organizers ÜTŐ Gusztáv and KÓNYA Réka; in the same context a welcome also came from Teodor GRAUR(Bucharest). The expressional register of the interventions was ample, from the discreet action imposing perhaps a certain kind of shyness and delicacy on reception, to the ostentatiously spectacular performances almost intimidating the public (more and more numerous and educated with every edition of the festival). 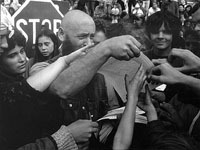 Some of the performances were interactive, stimulating the potential of the public to respond. Space and time merged into each other, every moment of the day being exploited. 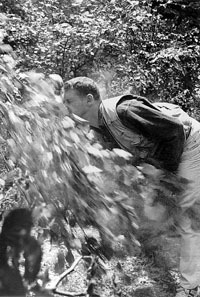 Even the cloudbursts contributed to the process-character of certain projects. Communication, beyond its accomplishment in conformity with the performances domain of definition, rounded out through multiple dialogues, mostly around the evening camp-fires. And the art critic the mission of the critic is a difficult one during such festivals but implies the possibility to become hardened while facing up to certain more complex experiences; under the circumstances of an increased physical mobility, a sharpened state of mind, freed of inhibitions, a speed of the essentialized putting down of ideas and spectacles, the critic assumes the responsibility of making the ephemeral of these situations eternal in written language, trying to preserve the unspeakable, too - his contribution, complementing film and photo-documentation, is essential in the perpetuation of the existence of Performance Art beyond the moment of its production. Lets try to recall shortly other points of reference. The condition of the artist, the way she/he relates to the contemporary world, with its various spheres, from economic to political: Teodor GRAUR, Cosmin PAULESCU (Romania), Piotr Wyrzykowski (Poland), Džugas KATINAS (Lithuania), MÁRKUS János (Austria) and DAMOKOS Csaba (Romania), Jan ŚWIDZIŃSKI (Poland). The artists identity discovers itself poetically in the identity of nature: MÉSZÁROS Ottó (Slovakia). Sacrifices of creativity, psycho-physical resistance and lack of understanding on the part of others: SZIRTES János (Hungary). Artistic effort, communicational effort: Pawel KWAŚNIEWSKI(Poland). Channels of communication, the distortion of information by the mass-media and the emergency brake pulled by the artist: Marilena PREDA SÂNC (Romania),Roland MILLER (England), BOB József (Romania). The minimal but suggestive restoration of certain mythological points of reference enriched with new meanings: GRIGORESCU Ion (Romania). The shaman-author, ritual performance: André STITT(England), SZABÓ Zoltán/Judóka (Romania). A descent in time to the basic values, the continuity of generations: Hortensia RAMIREZ (Mexico). Return to the purity of childhood, in the context of the liveliness of the natural environment: Julie BACON(England). Save the nature! : TORÓ Attila (Romania). Save the spiritual values of mankind, stop the way leading to disaster! : Pia LINDMAN (Norway), Roi VAARA (Finland), Władysław KAZMIERCŹAK (Poland). Watch over the impartiality of jurisdiction! : Olimpiu BANDALAC (Romania). An encouragement to get to know yourself by coming to know others and vice versa: Lia PERJOVSCHI (Romania). The subtilities of feminist discourse: Irma OPTIMIST (Finland). Irony and nuanced humour were present in some of the already mentioned interventions; they also were a prominent feature in the action of VERES Szabolcs - Cosmin POP (Romania),ELEKES Károly (Hungary). Boris NIESLONY (Germany) created a situation of limit focusing on the example of individual resistence. 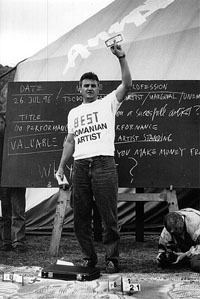 Dan PERJOVSCHI (Romania) contributed to the festival through his own everyday existence. In the end, Markus HENSLER (Switzerland) pleaded for the physical elimination of the boundaries of communication. 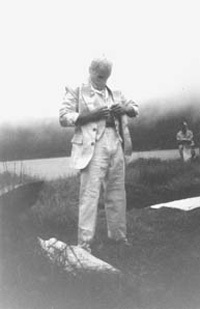 The meeting of ideas, getting to know each others specific features, the identification of convergences on an international scale characterized the artistic performances and the temporarily constituted community at Lake St. Ann on this occasion as well. We can talk about a constant stake of the AnnART Festival, confirmed and realized at this 7th edition, too. The 8th edition of the AnnART International Living Art Festival which has been organized on the 24th-26th Juliy this year is a world wide event. In the programmes, up to present, there have been participated 113 artists from 22 countries with the most diffrent production: ecological performance, cultic happening, theater of movement, sound poetry, alternative music, etc. The main points of view are: the geographical position, the chosen date and and the hinted audience. The events are developing on the shore of the only one crater-lakes of Europe on St. Ann's Day and the audience, mostly composed of young people, increase year by year trough native and foreign visitors. The St. Ann Lake and its surroudings are almost untouched touristic sights and AnnART is one of the most prominent cultural event of our region, so, I advise everybody to participate on AnnART 8 Festival in tents and in sleeping-bags, with good humour and ecological-feelings and, as far as possible, to aid this contemporary cultural programme.